Ali Marpet made a name for himself at the 2015 NFL Combine. The tackle from Division 3 Hobart was the fastest offensive lineman, running a 4.98 40 yard dash. The 2015 NFL Combine is now in the books. I will give recaps of the players that made money by improving their draft stock and some that may have raised some questions. Today I start with the offensive players. Tomorrow I will follow up with the defensive players. The talent of the offensive line group is down from the last couple of years. Teams that need offensive line help may need to spend an early pick on them. Ali Marpet, OL, Hobart (6-4, 307 lbs. ): I’m not sure if a Division 3 player has ever created as much buzz as Marpet. For a small school player, he has fit in very well with the big boys. He played left tackle in college, but some are projecting him as a center. I think he is a guy that you don’t necessarily draft with a position in mind, but you have to find a spot for him. 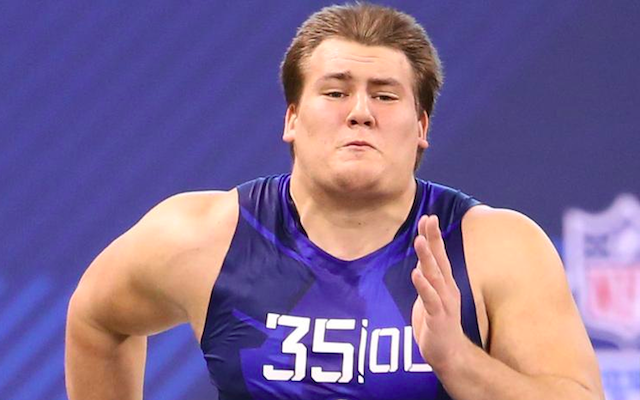 Marpet created a buzz by running a 4.98 40 yard dash which was the fastest of any of the offensive linemen. His other measureables included 30 bench press reps (#5 OL) and 7.33 3 cone drill (#2 OL). He also showed good athleticism in the on-field drills. Ereck Flowers, OT, Miami (6-6, 329 lbs. ): Flowers is a player that is rising up draft boards, likely even into the first round. He has the size you want for a left tackle. He needs some work on his footwork, but that can be cleaned up with good coaching. Had the most bench press reps of anyone at the combine with 37 reps of 225 lbs. La’el Collins, G/T, LSU (6-4, 305 lbs. ): Many questioned whether or not Collins could play left tackle at the next level, but he may have answered some of those questions with his performance in the on-field drills. There is no questioning his power, but he also showed some athleticism that not many people believed he had. He ran a 5.12 40 yard dash which isn’t bad for his size and he showed a good change of direction in the drills. Brandon Scherff, OT, Iowa (6-5, 319 lbs. ): Iowa continues to crank out good offensive linemen and Scherff is likely the top in this class. He has good size and has the ability to play any position on the offensive line. Scherff moved effortlessly in the on-field drills and his 5.05 40 yard dash was #4 among offensive linemen. D.J. Humphries, OT, Florida (6-5, 307 lbs. ): Nasty run blocker that is moving up the draft rankings. The main concern for Humphries was his lack of weight, but he weighed in at 307 for the Combine which is good. He has nice length and good arm length. He looked good in the on-field drills. Jake Fisher, OT, Oregon (6-6, 306 lbs. ): Looked better than expected. His 5.01 40 was the second fastest for the offensive linemen. His other measureables included 32.5 vertical jump (#3 OL) and 7.25 3 cone drill (#1 OL). There was concern over whether or not he was a left tackle, but he showed surprising athleticism in the drills. He has better feet than many thought. For the second straight year, the tight end class is average. Not many people think a tight end will be drafted in the first round this year. Maxx Williams, TE, Minnesota (6-4, 249 lbs. ): The top rated tight end. Has an NFL pedigree; his dad is former Giants center Brian Williams. Has soft hands and was smooth in the on-field drills. His 4.78 40 yard dash was good enough for third in his group and his 4.37 short shuttle time was a tie for third best for the tight ends. MyCole Pruitt, TE, Southern Illinois (6-2, 251 lbs. ): Went from a relative unknown to the fastest time in the tight end group, running a 4.58. His other measurables were a 38” vertical jump (#1 TE) and 4.37 short shuttle (tied for #3 TE). Jesse James, TE, Penn State (6-7, 261 lbs. ): Big target with a huge catch radius. His measurables were very impressive. Showed good strength with 26 bench press reps (#2 TE). His other measureables were a 4.83 40 yard dash (#6 TE), a 37 ½ vertical jump (#2 TE) and 10’1” broad jump (#1 TE). Clive Walford, TE, Miami (6-4, 251 lbs. ): Walford is a versatile player that can line up in-line and can help out as a blocker or receiver. He ran a 4.79 40 (#4 TE), 20 bench press reps (#4 TE), 35” vertical jump (#4 TE) and 10’ broad jump (#2 TE). This year’s group is Winston/Mariota and everyone else (or Mariota/Winston if you prefer). Winston and Mariota will be vying for the top quarterback taken (and possibly the first overall pick). Many top QB’s choose not to throw at the Combine, but both top guys chose to throw this year, which was refreshing. The race for the third quarterback is wide open right now and it’s anyone’s race at this point. Jameis Winston, QB, Florida State (6-4, 231 lbs. ): There aren’t a lot of questions about Winston between the lines. His biggest hurdle will be the perceptions about his character off the field. Showed good arm strength, a good release and accuracy on his deep balls. He looked comfortable dropping back from center and had good footwork. Winston showed good timing even though he had never worked with these receivers. His leadership really showed during the throwing drills and he showed very good football IQ while dissecting plays on the white board. Winston only ran a 4.97 40 yard dash, but I’m sure he can still outrun Peyton Manning and Tom Brady. His other measureables were 28 ½ on the vertical jump (#2 QB) and 8’7” on the broad jump (#2 QB). Marcus Mariota, QB, Oregon (6-4, 222 lbs. ): Has the same height as Winston, but is a bit thinner. While Winston is more of a pocket passer, Mariota makes his living outside the pocket. Whether it’s running the ball, or escaping the pocket, Mariota is most dangerous when he’s on the move. He is very athletic and has quick feet. He ran a 4.52 40 which was the top time for the QB group. His other measureables were a 6.87 3 cone drill (#1 QB) and 4.11 short shuttle (#3 QB). He also has the ability to make all the throws. Nick Marshall, QB/CB, Auburn (6-1, 207 lbs. ): There is no questioning Marshall’s athleticism. The question is at what position will he display his talents. Marshall played two years of quarterback at Auburn before transferring from Georgia as a corner. Marshall ran an option offense for the Tigers and he did it very well, even improving his passing numbers as a senior. However, some teams see him strictly as a corner, but I think he deserves a shot as a QB. Marshall ran the second fastest 40 time at 4.54 seconds. His other measurables were a 6.96 3 cone (#5 QB), 4.15 short shuttle (#5 QB) and was the top QB in the bench press (because he was the only one that lifted) with 12 reps.
Brett Hundley, QB, UCLA (6-3, 226 lbs. ): Tons of physical talent, but was not consistent. Had some of his worst games on the big stage. Ran a 4.63 40 (#4 QB), 6.93 3 cone (#3 QB), and 3.98 short shuttle which was tops among QB’s. The wide receiver group may be the deepest group of any for the 2015 NFL Draft. There are so many good receivers this year, that you could probably still get a quality receiver on day three of the draft and they come in all sizes. J.J. Nelson, WR, UAB (5-10, 156 lbs. ): Rail thin. Came into the Combine as an unknown, but left as the fastest player for the 2015 combine. Nelson ran a 4.28 40 which threatened the record of 4.24. He also had a 10’7” broad jump which was fourth best for receivers. He is too small to be used on every play, but in certain packages and as a return man, Nelson could make a big impact on a team. You can’t coach speed. Chris Conley, WR, Georgia (6-2, 213 lbs. ): Combination of size and speed. Made his living running 9 routes (go pattern) for the Dawgs. He is a raw player that will need some time to develop his route running. Ran a 4.35 40 yard dash which was the third fastest of the receiver group. His other measurables were 18 bench reps (#4 WR), 45” vertical (best of the Combine), 11’7” broad jump (best WR and #2 for the Combine). Kevin White, WR, West Virginia (6-3, 215 lbs. ): Surprising speed (4.35 40) to go with his big frame. May have vaulted himself into the top rated receiver in this class. Looked very good in the drills. Tracked the deep ball very well. Has the size to shake press coverage and to go up and get balls over DB’s. He also had 23 bench press reps which was good enough for third best among receivers. Dorial Green-Beckham, WR, Missouri (6-5, 237 lbs. ): Huge size. Has character concerns. Was kicked off the Missouri team and technically transferred to Oklahoma, although he never set foot on the field. Has the combination of height, weight and speed that NFL teams covet. Produced big numbers his last season for the Tigers. Devin Funchess, WR/TE, Michigan (6-4, 232 lbs. ): The question on Funchess was his position. He isn’t a threat as a blocker, so even if he plays tight end, it will likely be more as a slot or move tight end. Most people have him as a wide receiver, but he raised a red flag, running a 4.70 40 yard dash. Scouts will now need to go back to tape and verify if they think he plays faster. His pro day could be huge for him to see if he can improve his 40 time. Jaelen Strong, WR, Arizona State (6-2, 217 lbs. ): Big receiver with good speed. Draft stock is rising. He may need some work with his route running, but his 42” vertical (#2 WR) makes him a very desirable player. Justin Hardy, WR, East Carolina (5-10, 192 lbs. ): Led the nation with 9.3 receptions per game. Ran a 6.63 3 cone drill, which was the best of the entire Combine. Phillip Dorsett, WR, Miami (5-10, 185 lbs. ): Many thought he would come close to beating Chris Johnson’s 40 yard record. His 4.33 time was very good, but did not threaten the record. He also ran a 6.70 on the 3 cone (#4 WR). The running back group is also an impressive group. For the last two years there have been zero running backs selected in the first round. This year I think one, maybe two, may be selected on the first day. Jeremy Langford, RB, Michigan State (6-0, 208 lbs. ): Fastest running back at the Combine (4.48 40 yard dash). Showed great footwork. Runs very good routes and has good hands. Langford is a versatile back that doesn’t mind pounding it between the tackles, but can also bounce it to the outside. I think he is a very underrated player. Melvin Gordon, RB, Wisconsin (6-1, 215 lbs. ): Led the country with 2,587 rushing yards and 25 rushing touchdowns. I was surprised that he only ran a 4.52 40. He plays much faster than that and averaged almost 8 yards per carry. He is likely the first running back taken, probably in the 1st round. It will be interesting to see what his 40 time is on his pro day. Karlos Williams, RB, Florida State (6-1, 230 lbs. ): Big and powerful. I was surprised at his 4.48 40 time, which was the second best of the running backs. He makes his living pounding the ball between the tackles, but has good straight line speed. What he doesn’t have is a lot of shiftiness. He is a bit stiff on his cuts and he normally makes one cut, then goes. Ameer Abdullah, RB, Wisconsin (5-9, 205): Very good between the tackles and has good burst. Finishes runs by showing good pad level. Abdullah had some very good measurables. He had a 42 ½ vertical jump (#1 RB), a 10’10” broad jump (#1 RB), 6.70 in the 3 cone (#1 RB) and 3.95 in the short shuttle (#1 RB). Abdullah looked very smooth and quick in all the on-field drills. David Johnson, RB, Northern Iowa (6-1, 224 lbs. ): Johnson has the body of a big back, but he does his best work outside the tackles. He is a very good receiver and plays well in space. He ran a 4.50 40 yard dash (#4 RB), had a 41 ½ vertical jump (#2 RB), a 10’7” broad jump (#2 RB) and a 6.82 in the 3 cone (#2 RB). That’s it for my recap on the offensive players at the 2015 NFL Combine. Come back tomorrow when I discuss the defensive players. This entry was posted on February 25, 2015 by draftmaniacs in All-Star Games and Combine and tagged 2015 NFL Combine, 2015 NFL draft, Ali Marpet, Amari Cooper, Ameer Abdullah, Brandon Scherff, Brett Hundley, Chris Conley, Clive Walford, D.J. Humphries, David Johnson, Devin Funchess, Dorial Green-Beckham, Ereck Flowers, J.J Nelson, Jake Fisher, Jalen Strong, Jameis Winston, Jeremy Langford, Jesse James, Justin Hardy, Karlos Williams, Kevin White, La'el Collins, Marcus Mariota, Maxx Williams, Melvin Gordon, MyCole Pruitt, NFL, NFL Draft, Nick Marshall, Phillip Dorsett.